Kongo Falls in Super Smash Bros. Ultimate and Super Smash Bros. Melee. For the stage that originated in Super Smash Bros., see Kongo Jungle (SSB). 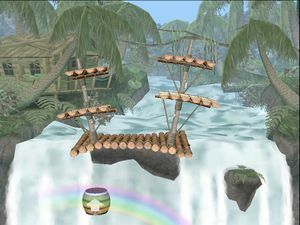 Kongo Falls (いかだと滝, Raft and Waterfall), previously referred to as Kongo Jungle (コンゴジャングル, Kongo Jungle) is one of three Donkey Kong stages in Super Smash Bros. Melee. This stage is played in All-Star Mode when the player faces Donkey Kong and any of his teammates. It returns in Super Smash Bros. Ultimate with numerous aesthetic updates. In Ultimate, Diddy Kong is fought here when being unlocked. The main fighting area of the stage is a raft stuck on the edge of a waterfall. The raft's bottom is fairly flat but has gentle curves that change as combatants run and jump on it. On either side is a vertical post with two platforms attached to the middle and top of each one. The posts themselves are always perpendicular to the raft, so when the raft moves a little, the post can change its position and thus change both platform angles on the posts. There is also a rock on which a character can stand on. It protrudes from the waterfall's edge on the right side. Below the raft is a spinning barrel moving back and forth. If a player's fighter gets caught in it, the player can push any button to launch out his or her fighter, who gets launched in the direction the barrel's arrow faces. The barrel also fires out fighters who are in it for too long. The arrow sometimes stops while pointing to the bottom. Characters can get caught in it for too long, causing them to be eventually fired downward and KOed. The barrel occasionally stops and spins in place. This stage also features a Donkey Kong series enemy, Klaptrap. If a character touches one, he or she flies off to his/her death at middle to high percentage (unless shielded or air dodged). Klaptraps occasionally get caught in the barrel cannon, where they still KO the player if he or she touches them, effectively rendering the cannon unusable. Finally, there are logs that occasionally roll down the waterfall and stop before collapsing momentarily. They give characters a narrow platform to escape to for a few seconds before plummeting to the bottom of the waterfall. When stage hazards are turned off in Ultimate, the barrel and Klaptrap are removed. In addition, the raft remains completely still when stood on. When the player fights False Donkey Kong in The Great Maze, the stage resembles Kongo Jungle (except the colors and background are different). In Super Smash Bros. Ultimate, the Ω form and Battlefield form are set on a completely flat version of the normal form's main bottom raft on top of a large rock. The main platform is also resized and reshaped to match Final Destination and Battlefield, respectively. The rock is absent in both forms and Klaptraps and large logs no longer occasionally appear. The three soft platforms of the Battefield form are flat versions of the ones in the regular form. 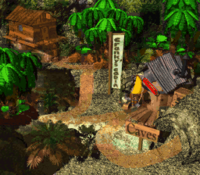 The Kongo Jungle region as it originally appeared in Donkey Kong Country. 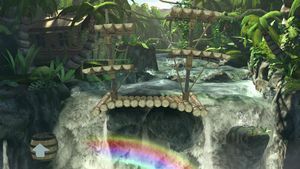 This stage is loosely based on the Kongo Jungle area from Donkey Kong Country; however, Kongo Jungle does not feature a raging river. In the background of this stage is Donkey Kong's Treehouse, which appears on the world map for Kongo Jungle and in the beginning of the first level: Jungle Hijinxs. Donkey Kong Country also features Barrel Cannons that the player can shoot out of, and they can be found moving either up and down, left and right, or diagonally. There are also stationary Barrel Cannons that rotate around. In Donkey Kong Country 2: Diddy's Kong Quest there are Arrow Barrels that fire at whichever direction it is pointing at. This stage features an Arrow Barrel; however, it moves horizontally while rotating. Klaptraps are a common enemy in Donkey Kong Country, and oftentimes are blue or purple; they crawl around and clamp their jaws. In this stage, they occasionally appear as a stage hazard by snapping their jaws at fighters as they come down the river. Kongo Jungle is usually banned in tournaments, primarily because the rock at the right of the screen creates an overabundance of camping. Klaptraps are also considered to be too dangerous and powerful for a stage hazard. King of the Rock is a gameplay method in Super Smash Bros. Melee which can be considered as a Special Melee but must be set up manually. This mode features no specific data within the game, but its gameplay is explained in the instruction booklet. It is only possible with human players, as there are no CPU commands to cooperate with this type of Melee. The suggested way to play King of the Rock is to first set up a 1-minute Melee on this stage and then position every player on the rock platform at the bottom-right. Every players' objective is to fend opponents away from the rock. Anybody who stands on the rock platform when the announcer calls "TIME!" wins. It is fairly low and small, meaning it can be tricky to land on. Panorama of Kongo Falls from Ultimate. Diddy Kong on the stage. Donkey Kong post-Giant Punch on the stage. Popo performing his forward smash. Meta Knight and Toon Link ready to battle. Olimar ascending with Winged Pikmin on the stage. Ryu using his side taunt on the stage. Snake and King K. Rool begin their battle on the stage. Kongo Jungle is notable for being the first stage in the Super Smash Bros. series to have fully vocalized music for its background track. The platforms sway from side to side a tiny bit. The only effect it has on players is that it could be slightly harder to land on them. Crates and logs float down the river. The latter gets stuck in the water unlike the former. Logs stick on either the left or right side of the stage. The stage's crates do not contain any items. Every once in a while, a Klaptrap which gets stuck in the barrel will be shot onto the stage, dealing 30% damage and often KOing every fighter in the center of the stage. However, it can be countered. This page was last edited on April 16, 2019, at 02:19.